Web tools are tools that allow individuals to create, collaborate, edit, and share user-generated content easily online. In most cases, the tools do not have to be downloaded or purchased and can be used directly from within a browser. The following Web Tools allow individuals to create online art. The following Web Tools allow individuals to create audio files. The following Web Tools allow individuals to create private chat rooms to be used during a lecture or lesson to limit the number of interruptions. 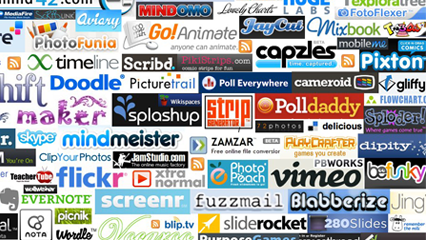 The following Web Tools allow individuals to create media with embedded content such as photos, text, links, and quizzes. The following Web Tools allow individuals to create blogs. The following Web Tools allow individuals to create online books. The following Web Tools allow individuals to create customized bookmarks that sync to the cloud so they can be accessed anywhere with an internet connection. The following Web Tools allow individuals to participate in small activities to help students regain focus. The following Web Tools allow individuals to store data safely online so that it can be accessed anywhere with an internet connection. The following Web Tools allow individuals to learn how to write computer code. The following Web 2.0 Tools allow individuals to create and collaborate with others by creating whiteboards and/or websites. The following Web Tools allow teachers to safely and efficiently communicate with parents and students through text messages, social media and/or applications. The following Web Tools allow individuals to create websites. The following Web Tools allow individuals to create, edit, and personalize maps. The following Web Tools allow individuals to research the definition and synonyms of words. The following Web Tools allow individuals to learn and practice appropriate ways to be a good digital citizen. The following Web Tools allow individuals to create web-based stories. The following Web Tools allow individuals to practice language art skills, free writing, and reading skills. The following Web Tools allow individuals to use their Epson Interactive Projectors to teach interactive lessons and play games. The following Web Tools allow individuals to create fake social media content such as fake Twitter posts or Facebook pages. The following Web Tools allow individuals to convert files from one format to another. The following Web Tools allow teachers to create quick assessments for their students such as polls, quizzes, games, word walls, etc. The following Web Tools allow individuals to use free legal clip art. The following Web Tools allow individuals to use free legal media such as images and videos. The following Web Tools allow individuals to use, create, and edit free online textbooks. The following Web Tools allow individuals to learn new content by watching videos, reading material, and practicing concepts. The following Web Tools allow individuals to create jeopardy style trivia games. The following Web Tools allow individuals to respond and engage to current topics using social media tools. The following Web Tools allow individuals to find answers to questions. The following Web Tools allow individuals to practice for the M-Step test. The following Web Tools allow individuals to practice math skills. The following Web Tools allow individuals to use tools to create equations, graphs, and geometric objects. The following Web Tools allow individuals to create organizers such as mind maps and/or flowcharts. The following Web Tools allow individuals to learn about music through game play. The following Web Tools allow individuals to create notes to organize information. The following Web Tools allow individuals to create magazines, merge and edit pdf files. The following Web Tools allow individuals to edit photos. The following Web Tools allow individuals to keep track of their physical fitness. The following Web Tools allow individuals to create beautiful presentations along with special content such as talking avatars. The following Web Tools allow individuals to create, edit, and print calendars and posters. The following Web Tools allow individuals to create and scan QR codes. The following Web Tools allow individuals to create pictures containing quotes. The following Web Tools allow individuals to create lists from which the computer will randomly select from. The following Web Tools allow individuals to listen to stories being read aloud. The following Web Tools allow students to research content in a kid friendly format. The following Web Tools allow individuals to find rhyming words. The following Web Tools allow individuals to share and record what is currently on their computer screen or browser. The following Web Tools allow individuals to practice certain skills or concepts through virtual manipulatives. The following Web Tools allow individuals to listen, watch, and learn the stories of Americans from all backgrounds and beliefs. The following Web Tools allow individuals to copy special characters. The following Web Tools allow individuals to learn and practice concepts of STEM (Science, Technology, Engineering, and Mathematics) and STEAM (Science, Technology, Engineering, Arts, and Mathematics) through tutorials, games, and simulations. The following Web Tools allow individuals to create and collaborate using virtual sticky notes and bulletin boards. The following Web Tools allow individuals to use stock footage to add to the background of videos such as a newscast or the introduction to a clip. The following Web Tools provides lessons and resources to individuals to help teach the Web. The following Web Tools allow individuals to create unique text. The following Web Tools allow individuals to enter text and have it read aloud. The following Web Tools allow individuals to set timers to help maintain the pace of an activity. The following Web Tools allow individuals to learn how to type correctly on a keyboard. The following Web Tools allow individuals to create shorter and easier to remember URL’s. Some of the following sites will also let you customize your short URL. The following Web Tools allow individuals to create and edit videos. The following Web Tools allow individuals to search, watch, upload, and edit online videos. The following Web Tools allow teachers to create an online learning space to help with collaboration, assessments, and the distribution of materials. The following Web Tools allow teachers to award virtual badges and/or currency to students. The following Web Tools allow individuals to create word art from text that is entered. The following Web Tools help individuals become better writers by proof reading papers. It also has special tools for teachers such as plagiarism checker. The following Web Tools allow individuals to edit, share, and adjust how they view YouTube videos.